Minisink Valley wrapped up their regular season with a 62-18 victory over Goshen on Monday. 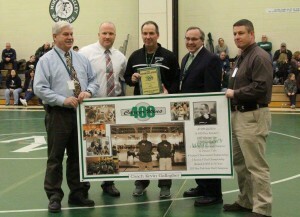 Minisink Valley 62 Goshen 18 Before the match started, Minisink Valley wrestling coach Kevin Gallagher was recognized by the school district for reaching 400 wins as a head coach. Gallagher, who notched #400 last Wednesday against Washingtonville, joins an elite group of NYS coaches to accomplish this milestone, and Section 9 is fortunate enough to have two other coaches in the 400 club. Wallkill coach Jeff Cuilty and Cornwall coach Don Blaine both have over 400 wins – both in the NYS Wrestling Hall of Fame. Check out some of Coach Gallagher’s coaching career highlights. Congratulations for joining the #400 win Club!!! Your Hard Work and Dedication have paid off . keep the Warrior Tradition a live! who was the state champ?